Standard framing includes your choice of either a primed wood jamb, or a white painted steel replacement “L” frame. Modern engineering provides a solid foundation for your new entryway with additional options. 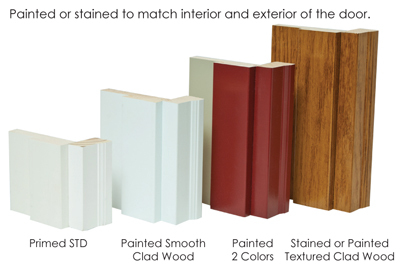 Select a new construction jamb and your doors, sidelites, and transoms will be built into a completely new construction jamb unit made of primed wood. Or select a steel replacement frame for your single or french door and replace your new sidelite or transom selections directly into the existing jamb. Replacement entry doors emerged on the marketplace during the 1970’s. The steel “L” frame shored up the jamb giving it the security that homeowners desired. 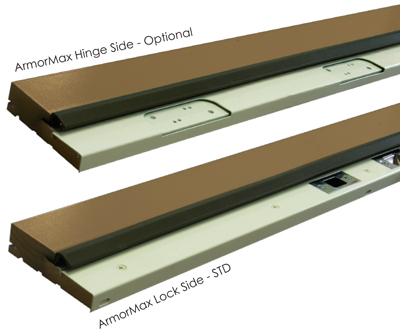 After listening to our dealer’s concerns ArmorMax Jamb System™ was created to replicate that level of security in a new construction jamb. 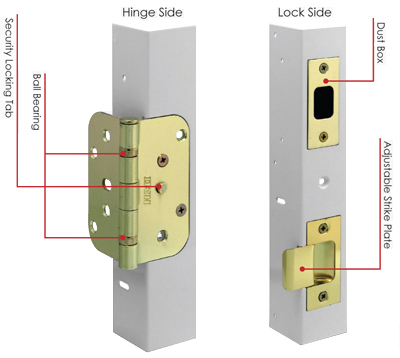 The 18 gauge steel “L” frame is embedded in the jamb on the lock side (hinge side is optional) giving it the strength and security of a replacement door. 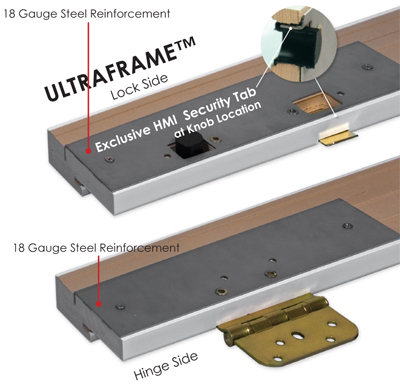 The Patented HMI Ultraframe™ has 18 gauge reinforcement steel plates placed behind the deadbolt, knob, and 3 hinges. The steel reinforcement plates are constructed in an “L” shape, which provides strength for a stronger mounting point and resistance against break-ins. Steel Replacement Frames are constructed of 18 gauge galvanized steel with 10 gauge plates located on the lock and hinge sides for extra reinforcement to help keep intruders out. All replacement frames are finished with a powder coating. White is standard.